You can now send input to Workflow app and execute a wide range of workflows while using a single action. Please make sure that you have downloaded the Workflow app in your iPhone/iPad to use all the examples which are described in this article. 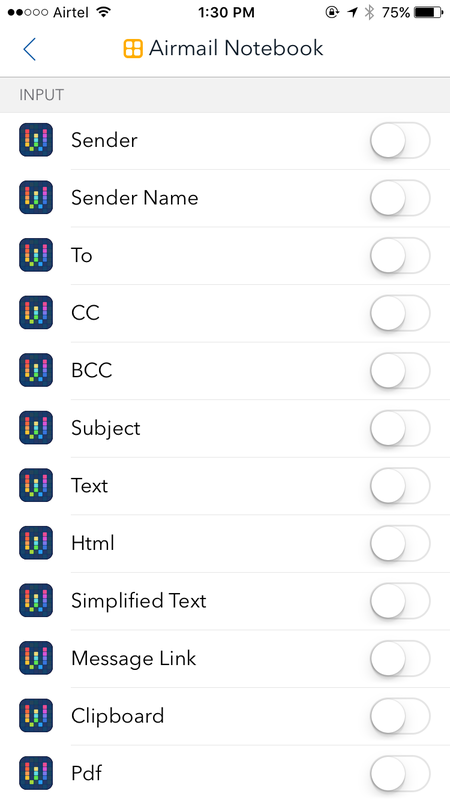 Make sure that the Workflow app is enabled in Airmail Settings > Services > Send to Workflow. Please note that &apos;Send to Workflow&apos; action will only be available when you create a &apos;Custom Action&apos;. How does the Workflow app integration work? The integration works in four number of steps as described in this section. Is specifying the name of the workflow that you have already created in Workflow app. 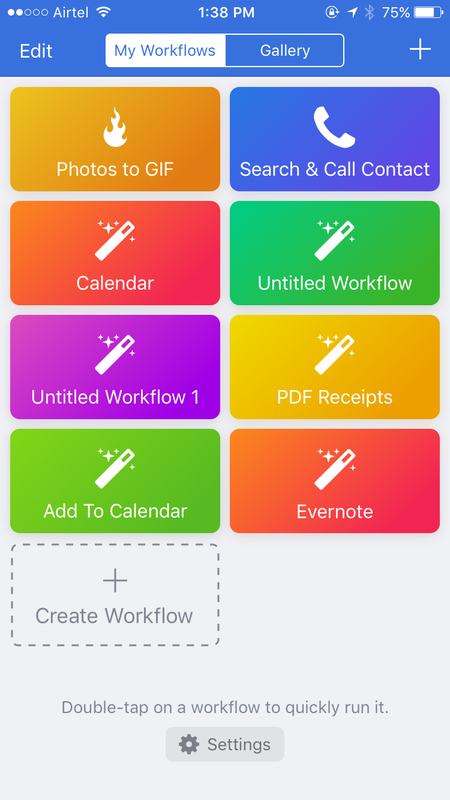 For example, in the following screenshot of Workflow app, we have created 8 workflows. 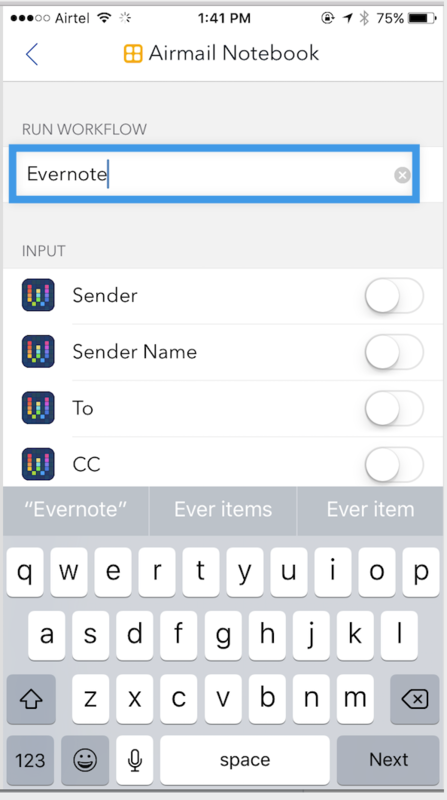 Now, if you wish to run the &apos;Evernote&apos; workflow, you will have to specify it in Airmail as shown in the picture below. 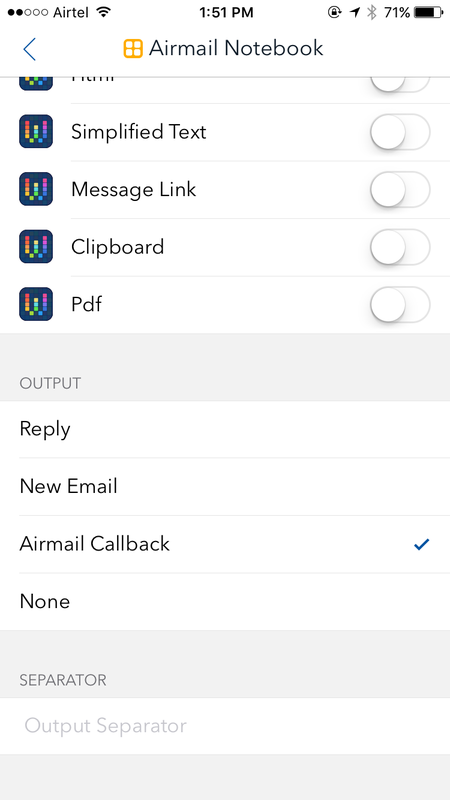 Airmail allows you to send specific parameters of any message to Workflow app as &apos;Input&apos; and run an existing workflow (explained in Step 1) in the Workflow app using these input details (shown in the picture below are the type of input data Airmail can send to workflow app for any given message). For example, if you wish to pass a Pdf file of a message to a workflow, just enable Pdf option shown in the screenshot above. This is to specify which action you want to run after the Workflow app has run the workflow specified in steps 1 and 2. The available options are show in the picture below. Reply - To reply to the message that you ran the workflow on. How to send a message to a specific Notebook in Evernote? Go to Airmail Settings > Custom Actions > Create and name the new custom action (in this example, we name it &apos;Save to Airmail Notebook&apos;). Choose &apos;Add Action&apos; > Send to Workflow.